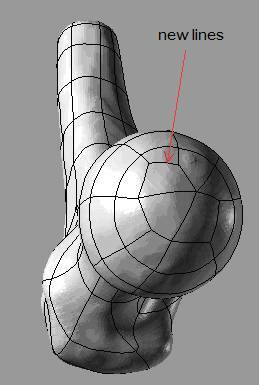 In this tutorial we will show how to create a solid from a selected mesh by 6 steps. The new added command RsSplitCurveNetwork in RhinoResurf is very helpful for user to reduce working time rapidly. 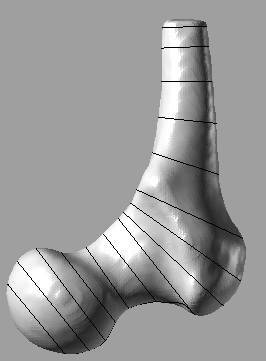 Firstly, user creates some section lines and poly lines on mesh, then RsSplitCurveNetwork will split those curves automatically, and a curve network composing of pure quad face is built. This curve network will be inputted in RsMeshSurfs, and nurbs surfaces will be created automatically just clicking several buttons. Due to the fact that those nurbs surfaces have no gap tolerance on their transition boundary line, they can be sewed as a solid. Step 1 : Use Rhino command _section to create section lines. 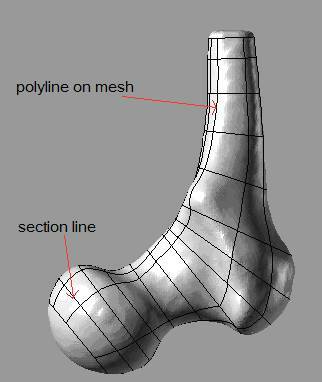 Step 2: Use Rhino command _PolylineOnMesh to create some lines which intersect the above section lines, and they compose a quad face curve network. 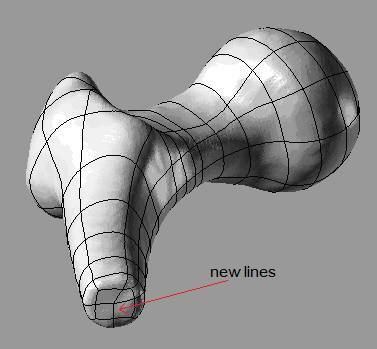 Step 3: continue to use Rhino command _PolylineOnMesh to create more lines for a completed curve network which covers the whole mesh model . Step 4: Use RhinoResurf command _RsSplitCurveNetwork. Select the above curves, a dialog will show. 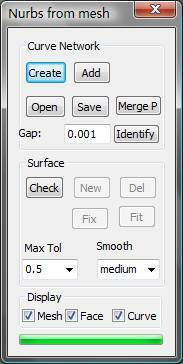 Set the gap tolerance to be 0.0001, click the button Split, the curves will be splitted into segment lines. 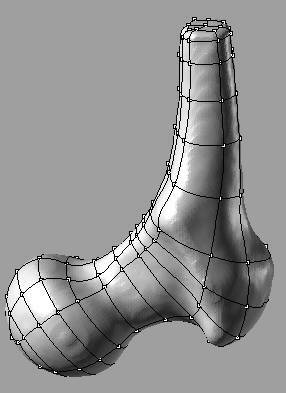 Step 5: Use RhinoResurf command _RsMesh2Surfs to create nurbs surfaces from the splitted curve network. 5.1 click the menu item Surfaces from mesh by curve network , a dialog as the following picture shows. 5.2 click the button Add , select all the curves, click right mouse button, the selected curves will be registered to the selected mesh. 5.3 click the button Merge P, fix the curve network connectivity. 5.4 click the button Check, base quad faces will create. 5.5 click the button new to add new face if necessary. In this case you do not need to new face. 5.6 click the button fit to create advanced faces, the face will fit to mesh with high precision, the transition will reach G1 continuity. 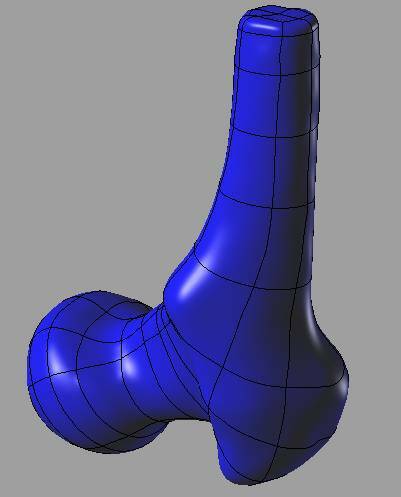 Step 6: Use Rhino command _CreateSolid to make the closed nurbs surface be a sold.